Bromsgrove artist Richard McIlwraith meets local poet and illustrator Penny Turner. Head to The Jinney Ring Craft Centre and seek out a small ground floor studio-shop, from where Penny Turner greets you with a smile. The room sets your imagination firing: lines of enchanting poetry spark your own creative impulse; fascinating illustrations of whimsical, gleeful characters add visual dimensions to the carefully crafted words. Penny dreams up, writes and draws. The result of this triple-process is a powerful set of appealing scenes and stories that have the potential to entertain the whole family and to introduce us all to playful and hilarious characters and situations. You can imagine Penny chuckling away quietly to herself as she exquisitely brings to life her comic thoughts. The room is full of captivating gifts. There are illustrated books, greetings cards, giclée prints, mugs, money boxes, coasters and cushions. You feel a charming atmosphere of delight and humour, a heart-warming ambience that leads to laugh-out-loud moments when the unique creations adorning the walls and shelves capture your attention. As I hitched a ride on a giant snail. With a friendly cat in a kitchen sink. That flew us home on lemon strings. 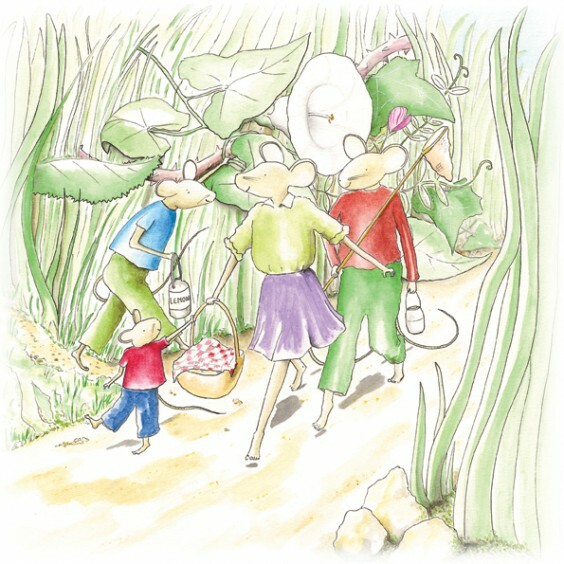 Her latest book is titled Four Little Mice and is sure to combine drama and frivolity, charm and wit: a must-buy indeed. Penny gives talks and presentations at local groups or clubs, revealing the ideas behind her poetry and the various techniques used to bring ideas to fulfilment. So, I hope readers make a special journey to the Jinney Ring (Hanbury Road, Hanbury, Bromsgrove, B60 4BU) and drop in on Penny to see and read for themselves the entrancing work on display.